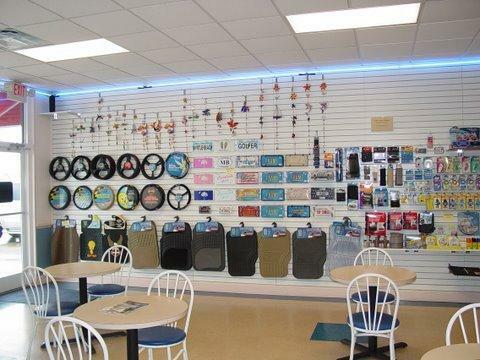 We carry license plate frames, inserts, steering wheel covers & floor mats. We have a wide selection of air fresheners and accessories for your vehicle. 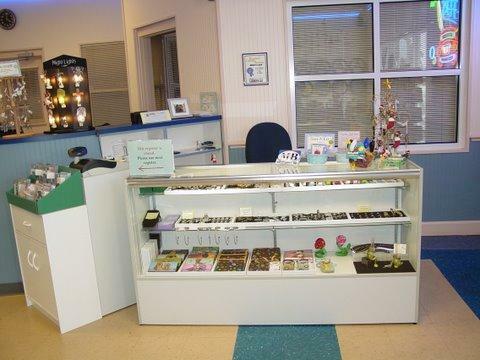 Relax in the comfort of our Lobby Gift Shop while you wait for your vehicle! 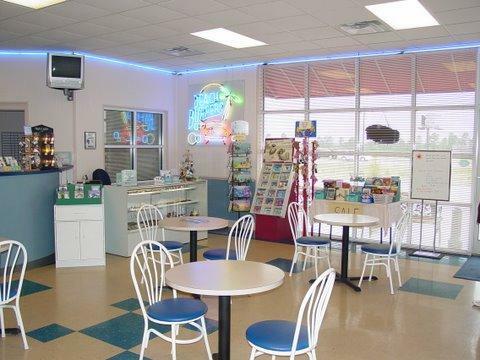 Our lobby has seating and tables so you can enjoy a snack or a soft drink while your wait. If you favor the outdoors we offer benches outside. Our customers tell us we have the cleanest rest rooms in Myrtle Beach! If you have errands to run, make use of your valuable time, drop your car off for your services and have lunch at any of the restaurants or fast food establishments in the shopping center. It's all within walking distance. Auto Accessories - floor mats, wiper blades, steering wheel covers, license plate frames and inserts, organizational items such as trash cans, registration wallets, clothes carriers and smokeless ash trays. 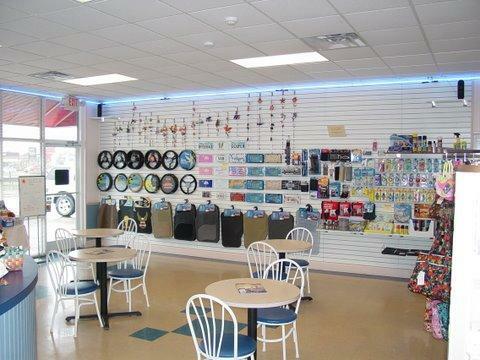 Everything from air fresheners to valve caps for your car. South Carolina and Myrtle Beach themed items - license frame inserts (palmetto flag, carolina girl, etc. 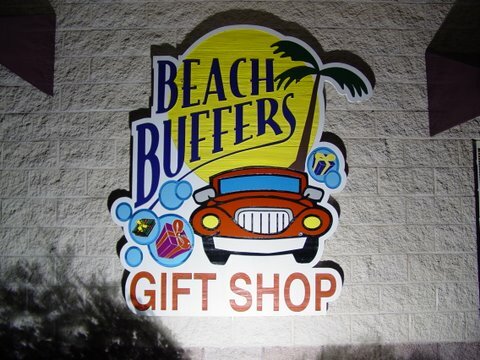 ), vinyl decals and sandstone decals in various colors and styles like the South Carolina flag, flip flops and dolphins. All made in the USA! Leanin' Tree Greeting Cards - everyday cards, magnets, notepads and boxed cards. Check out our year round selection of beautiful beach and tropical themed Christmas cards. All made in the USA! Novelties - Car charms for your rear view mirror and visor clips. Counter Art Auto Coasters (for cup holders) and Home Coasters - We have USC and Clemson plus lots of tropical beach designs! 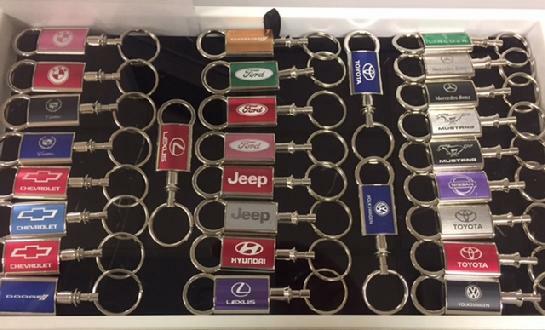 Car Logo Key Rings - BMW, Chevrolet, Dodge, Toyota, Ford, Hyundai, Jeep, Lexus, Mercedes Benz, Volkswagen, Mustang and lots more! Things with Bling - Sparkling rhinestone key rings, initial key rings and initial charms, bracelets, and jeweled trinket boxes. Items For The Home - Ocean and beach themed items featuring wine bottle toppers, napkin rings and cheese cutting boards. Stained glass chimes and suncatchers, decorative beach themed night lights and sentiment plaques. 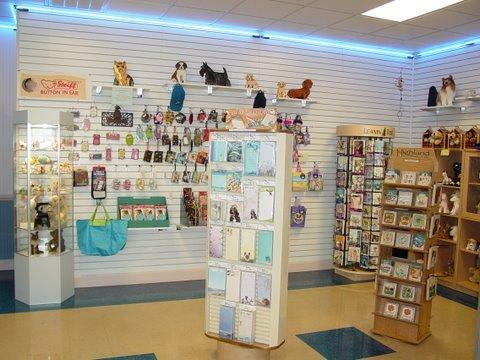 Pet Boutique - For that special four-legged friend in your life! Collar charms, barrettes, glass and resin Dog Christmas Ornaments. We carry Counter Art coasters for the home and car.